My spellcheck hates this title, but I must say, “new” in 2 languages rocks! The Library Without Books Memorial on the plaza where the Nazis hauled the books from the public library and burned them. The painted bears everywhere, the symbol of BEARlin. But I believe the construction everywhere is the clearer symbol. The Brandenburg Tor, seasonally rivaled by a Christmas Tree and an equally large menorah. The Bridge of Griffins, which Hitler refused to have blown up and which the Russians used to cross the Spree and reach the Reichstag. The enormous Tiergarten, the “Garden of Beasts,” formerly the private hunting grounds of the royalty, approached by the Linden Tree Avenue [“Unter den Lindens”]. The Tiergarten is open parkland now, larger than Monaco, but during the occupation of Berlin til 1949, the British authorized planting potatoes and other veg by the starving Berliners. The Marx-Engels Forum, still so-named and with larger than life statues. This gave me the creeps, but apparently there is some legal hitch to changing the park and removing the statues. My fear is that the young Berliners will come to think of these men as hip, the way the young have embraced Che t-shirts, not knowing anything about the man himself. With all this under our belt, we still made it to the Neues Museum by 10ish. Despite Ron’s maplike memory and study of Google street view, things had changed on Museumsinsel [Museum Island], due to—you guessed it—construction. So we made our way all the way around the island, the equivalent of going around our elbow to get to our nose. Flashing our passes got us a flourish from the guards [cheapest thrill in town]. The floor plan to the museum, however, was useless, as nothing was in the place indicated on the map. And there was no guidebook. I’m guessing that displays are in such flux at the Altes and the Neues that it makes no sense to publish one. This is the day we discovered that, despite their vaunted efficiency, the Germans do not believe in signage, permanent or temporary. I don’t know whether it is because of the power such knowledge gives to those in charge; we did find tendencies toward this attitude among the various guards, but it was a frustration to us. We also enjoyed displays of pre-dynastic Egyptian artifacts of very high quality [think 5500 years old]. This baboon has King Narmer's name on the base; they used to think he was legendary, but they keep finding his stuff. We stopped for lunch about 2 pm, wrung out and thirsty. We bought Coke light, which cost more per liter than beer, but it sure was refreshing. We had a nice deli-type lunch. We then moved on to the most stunning work of art I have ever seen: the bust of Nefertiti. They would not allow photos of her, so just google her. She is life-sized, with a swan neck and regal crown. Her features are perfect and the painting so lifelike, you expect her to speak. She is missing one of her inlaid glass eyes and this is the only imperfection. The remaining eye glints so that you think it is moist. I have wanted to see this statue since I first took history of art; no picture does her justice. The bust was found in the sculptor’s shop; she was apparently the masterwork from which others were to be produced. 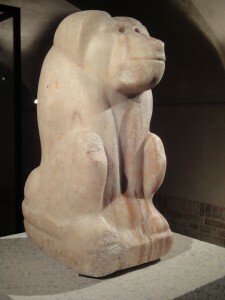 For example, there is one in the museum in Cairo along these lines, but unfinished. Berlin has most of the Amarna site artifacts, as it was German teams that did most of the archaeology. Amarna was the new capital built by the radical pharaoh Aknaten, when he banned the pantheon of Gods and focused on only one, the sun disk Aten. Nerfertiti was his wife; Tutankhaten, his son. The items are in generally poor condition, as the site was razed and then abandoned when his successor moved back to Thebes and became Tutankhamen. Unable to finish the museum by the time it closed, we resolved to return Tuesday and went to our hotel for a nap. 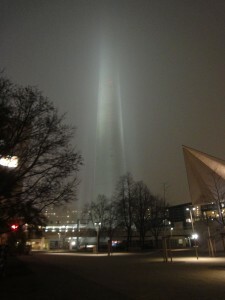 When we arose to go get dinner, we found Berlin shrouded in fog. The radio tower close-by was turned into beams from a UFO and the large Ferris wheel looked like sugared candy. Following up on a suggestion from the tour that morning, we went into a cozy diner and ordered Currywurst and pommes. This sounded so German and exotic, but it turned out to be a fatty hotdog drowned in ketchup, with curry powder on top. The pommes were in fact French fires, not freshly made, but the crinkle kind you buy frozen. Yuck. [Pommes in French means apples, so I was expecting backed apples with spiced bratwurst. Pommes de terre = earth apples = potatoes]. Ron drowned his with a Berliner pilsner. 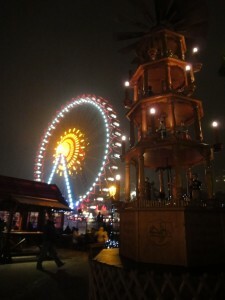 Hearts burning, we strolled through the nearby Christmas market, buying a number of things on our list and spotting others. It is hard to use credit, let alone debit, in Berlin, so we resolved to return with cash. And to the hotel and zzzzzzzz.